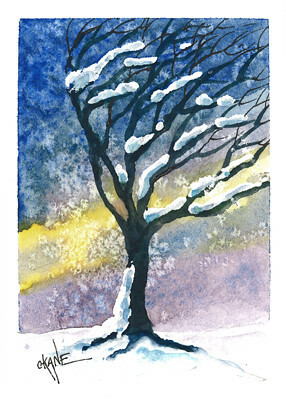 Winter Tree Watercolors Plus Sound – Let's Paint Nature! Every time I begin a painting I ask myself, “What feeling are you trying to portray?” Do you remember the first time a chickadee surprised you on a tree branch? That instant feeling of delight? I want to capture that feeling and express it through the medium of watercolors or pastels. Or how about the cold blowing snows in winter? What an exhilarating, magical feeling! If I can give the viewer two senses (sight and sound) instead of just one (sight) it will greatly advance their chances to really experience the art! Are you chilled to the bone? Can you feel the snow hitting your face? Oh how much fun! 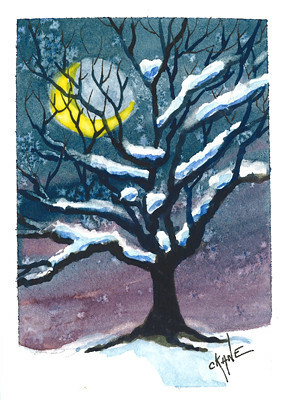 I know it’s a little too early for snow, but I painted these little watercolors in preparation for the Holiday Art Show at the LaGrange Art Gallery coming up this November. Now for the other senses (smell, touch, and taste). Can I ask you to hold a piece of ice and eat an ice cube for touch and taste while viewing the paintings? HA HA HA!!!! Just kidding!